The Vienna New Year's Day Concert was founded and introduced by Clemens Kraus in 1940 and has been performed ever since in the famous Musikverein in Vienna, and started during the difficult and somewhat murky war years. But one can say that the concert started to acquire its world status only after the end of the second world war, increasing in status and world coverage over the years. It was first televised in 1959. More detail may be found on the Vienna Philharmonic Website at https://www.wienerphilharmoniker.at/new-years-concert/history. The concert is now relayed live to some 90 countries making it by far the most well known and listened to concert broadcast in the world. The programme listing for the Vienna New Year concerts since 1999 are listed in this section. A list of earlier concerts appears in the members section. The Society has a complete record of all the music played since the inception of these concerts in 1940. All the concerts since 1983 have been issued complete on CD and DVD (1986 excepted) with only sporadic recordings before this on LP. But to mark the 75th anniversary of this event, Sony has released a 23 box set entitled New Year Concerts - The complete works. This may not be an entirely accurate description, but it is an excellent collection containing 139 works It can be purchased online through the usual sales outlets, such as Amazon. Tickets for the New Year Concert in Vienna are extremely difficult to obtain. Please refer to FAQs for ticket enquiries. 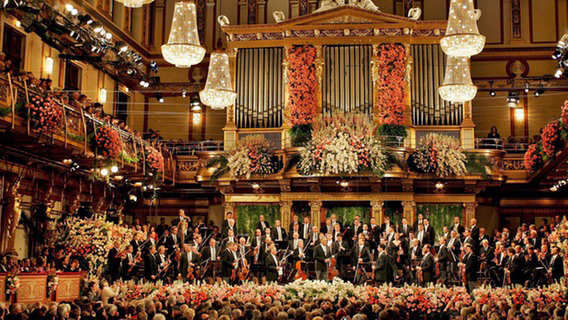 Viennese New Year Concerts are regular events held all around the world, some of which are listed on our Events page.